Recently, I was given the esteemed privilege of spending a full day playing the latest in a long and legendary line of a beloved Nintendo franchise. I was ushered into a room with a few other journalists, sat in front of one of many HDTVs, and then simply handed a Wii MotionPlus controller. "Ok, guys. It's all yours." And from that moment in the morning until late in the day, I played The Legend of Zelda: The Skyward Sword. I explored entirely novel and sometimes oddly familiar surroundings, I fought epic battles with new and challenging enemies, and I found strange and elusive objects that would be of great importance later in my quest. Oh, but that all comes later. Let's start from the beginning. Link begins his story as he often does in The Legend of Zelda series, rudely awakening from a troubling and foreboding dream. In the case of Skyward Sword, Link envisions himself desperately trying to get away from some enormous world-eating darkness, with a snarling fanged mouth and furious red eyes. When he wakes up, an odd, large bird is sticking its head through his bedroom window. This bird, as it turns out, is of a species called Loftbirds on which the citizens of Link's city get around. 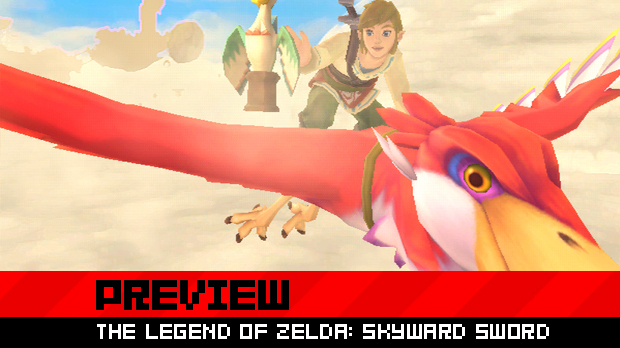 As has been covered in past previews, Link lives in a place called Skyloft, floating high above the world among the clouds. The world below Skyloft is a mystery to its denizens, and the most pressing concern facing Link at the moment is gaining another step into his Knighthood. Link is a student at Skyloft Academy, where young knights-in-training work to earn their esteemed position as the flying defenders of the city. Immediately after I leave Link's room in the Academy, I'm immersed in the world of Skyloft. I speak to a fellow student and resident bird expert name Pipin, who encourages me to go talk to one of the professors about pressing matters. While speaking to Pipin, I can't help but be impressed by the colorful and engaging characters and art style of Skyloft. Once I'm actually able to step outside for the first time, what strikes me the most about what has changed in the series, beyond the Wind Waker style of cel-shaded art, is the fluidity of movement. For the first time that I know of in a Zelda game, I'm actually able to wall-run. For me, this is pretty exciting, and I test several different surfaces to see where I can wall-run. Once Link gets close to the edge of the surface he's running up, he automatically grabs and clings on. Link can also sprint -- he can break into a normal run as fast as before, but when he sprints he gains just a little more speed. Naturally, this takes energy, indicated by a sprint meter that rapidly empties out. Fortunately, there are little green bulbs of some sort of plant all around Skyloft, and when Link collects them, his sprint meter instantly replenishes. I climb up to the roof of the Academy and run into one of the professors, who asks me to help catch a cat-like creature higher up that belongs to one of the Skyloft residents. 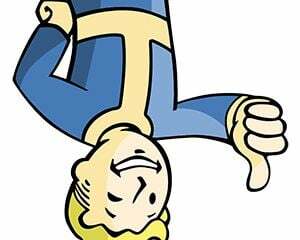 I oblige, jumping across rooftop sections and climbing along walls with relative ease until I reach the kitty creature and grab it. I bring it back to the professor and casually toss it at his feet, getting his thanks as a response. 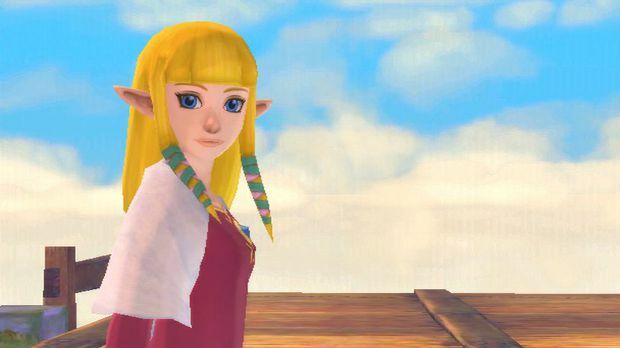 After just a little bit of exploration, I'm introduced to Zelda, who is both an old friend of mine and the daughter of the Headmaster of the Sky Academy. Zelda considers me a lazy, starry-eyed boy who is not fit for Knighthood. Her father thinks differently, citing my natural connection with my Crimson bird as a strong indicator of my hidden talents. He believes that the upcoming race in the sky will be mine to win. Zelda, being the awesome friend that she is, shoves me off of a nearby platform in the interest of having me prove to her my supposed abilities with my bird. Something is wrong. My strange red bird isn't appearing beneath me, and I keep falling. Zelda and her father stand around idly, making pithy comments about the amount of time it's taking for my bird to rescue me from my plummet. Finally, Zelda jumps into the sky and calls for her bird, who appears instantly and aids her in rescuing me from certain death. The first objective of sorts has now come into play. My bird has gone missing and I have to find it. 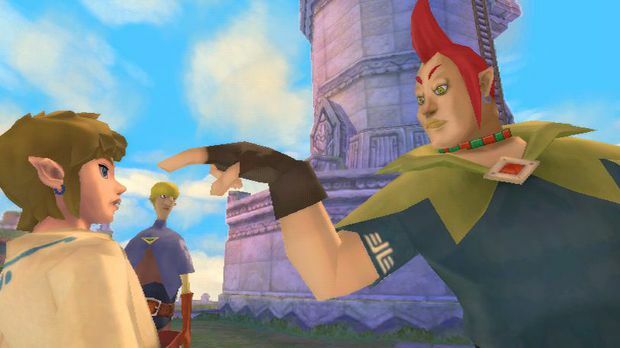 I wander around Skyloft for a little while until I run into a haughty guy with a pompadour named Groose. He is followed by two cronies, a short girl named Cawlin and a lanky boy named Stritch. Groose brags about how he's going to win the race and makes it pretty obvious that he probably has something to do with my bird's disappearance. This soon leads me into getting a sword to help me in my first quest. The academy has a sparring hall that I visit, where I'm given a practice sword and encouraged to try it out. This is where I get my first real feel of using the sword with the MotionPlus controller. I wildly swing my Wiimote at the first log I see. It plinks against the wood, but nothing significant happens. Finally, I realize that the log has a horizontal gash mark through the middle. I raise my arm up and do a horizontal slash. The log breaks into pieces. Satisfied with my newfound ability to be precise with my sword, I saunter over to the next log. This time, it gets a little more complicated, as the gash is a line going downwards in a left to right diagonal. I match the direction of the gash with a careful upwards swing, and the log breaks into pieces. Like a boss. After cutting every log in the training room with slashes in various directions, I'm ready to take on the world. I run to the door and am about to take off when the sparring instructor stops me. I have to return my practice sword. Once I explain my predicament he lets me keep the sword, as long as I use restraint. Naturally, as soon as I exit the sparring hall, I wildly swing my sword at patches of grass, butterflies, weeds, and anything else I can possibly damage or otherwise harm. I come across a pumpkin patch and start slashing pumpkins left and right. Through sheer accident, I stab a pumpkin and it sticks to the edge of my sword. Mmm, shish kebabs! I toss the pumpkin with a hearty throw of my arm and watch it sail into the clouds. I realize soon after that an actual skewering motion is what gets a pumpkin to stick to the sword, and pretty soon I'm skewering and tossing pumpkins with wild abandon. 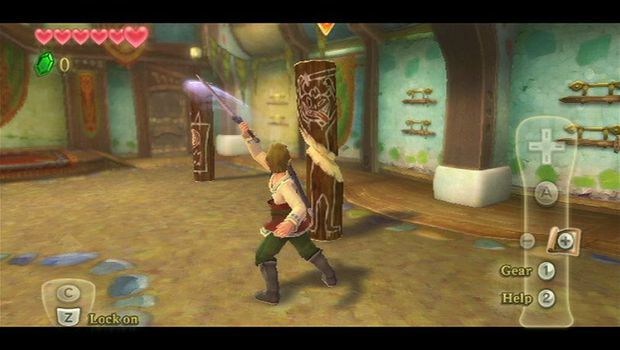 This is what I really love about Skyward Sword already -- the fact that the MotionPlus aspect isn't some tacked-on gimmick. It affects every single part of the game, including the silliest of details. Yes, I can now finally truly skewer pumpkins with 1:1 motion in a Zelda game. This is almost as epic of a discovery as my first realization in A Link to the Past that I could not, in fact, endlessly abuse the chickens. Once I've had my fill of pumpkin, I do a little more exploring and NPC-questioning until I find a cave barred up with wooden boards. A short cutscene informs me that my bird is trapped inside, and I cut the ropes keeping the boards in place with precise swipes of my sword. I come across my first enemies, a few bats and jellies that are reminiscent in design of the same types of enemies in Wind Waker. Both are just a little trickier to kill however, as they require that I swipe accurately in the correct direction to hit them. After a couple of relatively easy puzzles and a few more tussles with less skillful enemies, I rescue my bird and I'm finally ready to enter the race that will get me just a little closer to Knighthood. The race begins shortly thereafter, and I have to guide my bird using the Wiimote, similar to the way you controlled the giant bird creature in Twilight Princess. I can climb to a higher elevation and gain speed by raising the front of the Wiimote and dropping it down. Once I get the hang of this, I find the race to be relatively easy. The goal is to grab an item out of the talons of a golden bird that is flying ahead of all of the racing Skyloftians. After I almost manage to do it once, Groose and his cronies decide to make it a bit more challenging by throwing bombs at me as I weave through the clouds to grab onto the special item. With a little bit of concentration, the special item is mine. It's some sort of mystical shard, an artifact that fits into a carving at the base of the Goddess Statue that overlooks all of Skyloft. 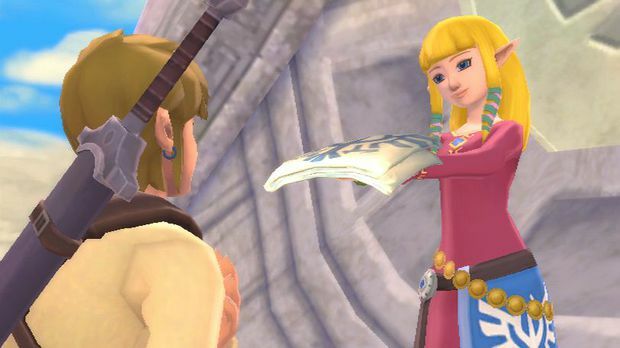 At the top of the Goddess statue, Zelda gives me my prize for winning the race and retrieving the item, a sailcloth that lets me jump from great heights and parachute down without harm. I'm encouraged to try it out by doing a little bit of base-jumping from the statue, and here again I have to use the controller to carefully pivot myself to the center of a circular plaza below. Soon after this, Zelda and Link decide to take to the skies on their Loftbirds in search of adventure when an enormous tornado separates the two, snatching Zelda away from Link. 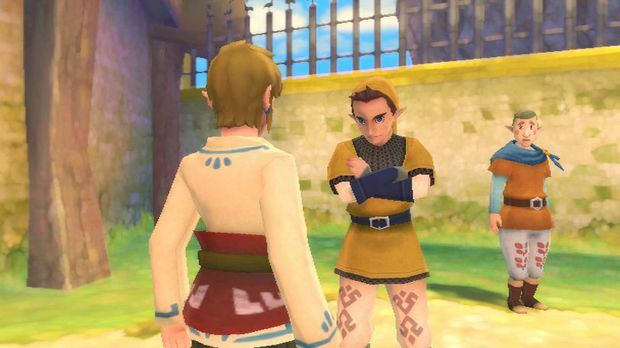 When Link wakes up, he is introduced to Fi, the character that replaces Navi in earlier Zelda games. She starts as a vision that Link must follow to a secret area underneath the Goddess statue. 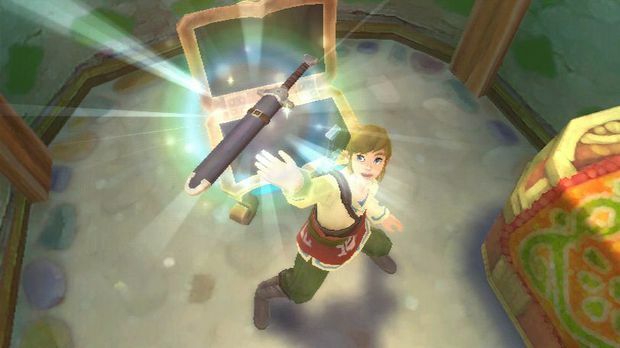 Fi brings Link to a room where the legendary Skyward Sword is kept, and as has always been true to the Zelda games, Link takes up the sword to become the next hero of legend. Soon after, he is given his green garments, which in this game serve as the garments worn by those in his level of Knighthood. And that is where I must end this preview. 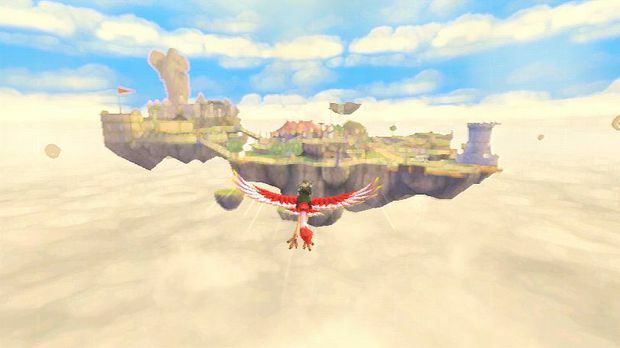 Stay tuned in the following weeks leading up to release as I cover various elements of the massive world that can be found in The Legend of Zelda: Skyward Sword.